250 Commonwealth is located on the south side of Commonwealth, between Fairfield and Gloucester, with 246 Commonwealth to the east and 252 Commonwealth to the west. 250 Commonwealth was designed by architect George Nelson Jacobs and built in 1925 for the 250 Commonwealth Avenue Trust. 250 Commonwealth replaced two townhouses at 248 Commonwealth and 250 Commonwealth. 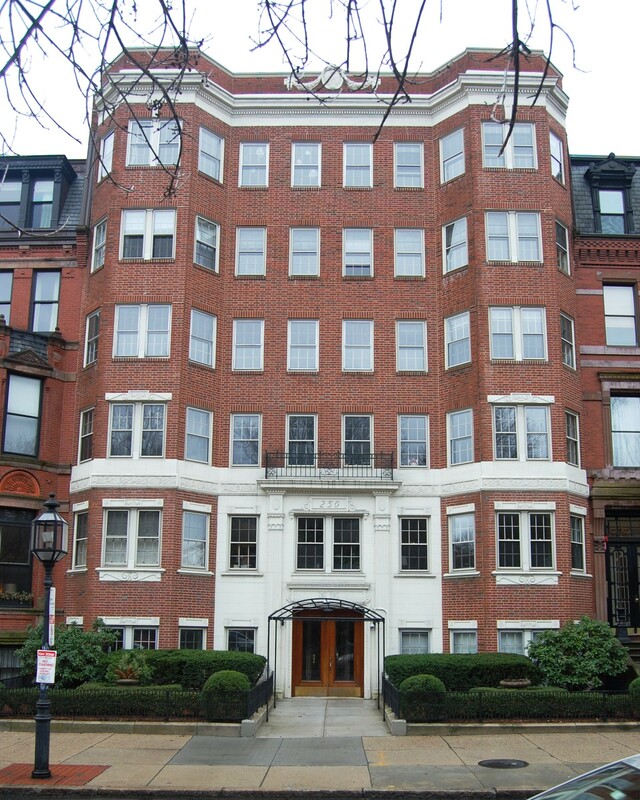 Both houses had been purchased on December 5, 1924, by real estate dealer James M. Burr, who transferred them on May 25, 1925, to Sherman F. Mittell, a real estate and insurance broker in Cambridge, who held them as trustee of the 250 Commonwealth Avenue Trust. Click here for an index to the deeds for 250 Commonwealth. On August 13, 1925, Sherman Mittell certified that he and George Nelson Jacobs were the owners of a majority interest of the share in the trust and, in the same document, he resident as trustee and George Nelson Jacobs was appointed successor trustee. That same day, George Nelson Jacobs filed the original building permit application to construct the new building. The original permit application indicated that the building would contain twenty apartments plus a janitor’s suite in the basement. By 1927 — and probably as built — it was a twenty-two unit building. 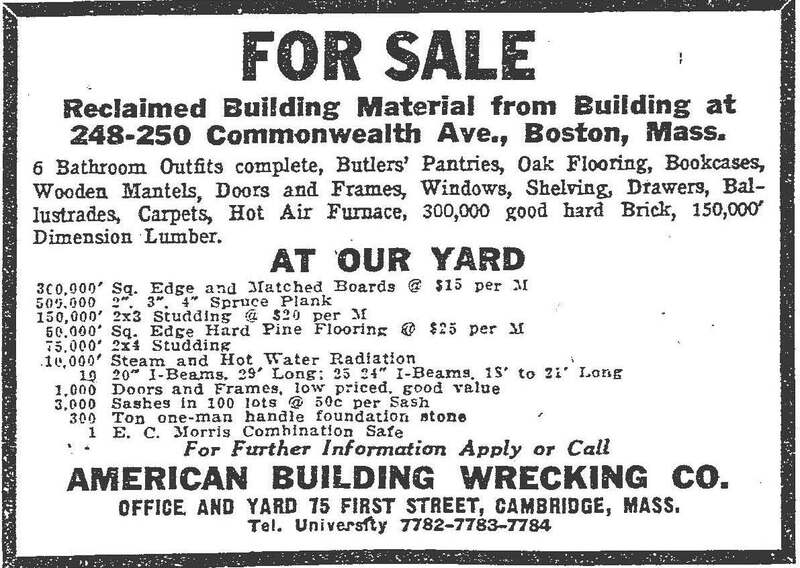 On September 1, 1925, probably prior to the commencement of construction, 250 Commonwealth was purchased from George Nelson Jacobs by Ralph E. Snider and Samuel J. Wolfson, trustees of the Tudor Realty Trust. The building was completed by the 1926-1927 winter season. On June 18, 1935, the New York Life Insurance Company foreclosed on its mortgage to the Tudor Realty Trust and took possession of the building. It continued to own the building until 1942. On December 31, 1942, 250 Commonwealth was purchased by Solomon Rokach (Schulim Roikach) and his wife, Irma (Naschelski) Rokach. He died in September of 1949, and she died in December of 1971. In her will, Irma Rokach left 250 Commonwealth in trust, with Norman Myron Fain (Solomon Rokach’s first cousin, once removed) as trustee. On September 21, 1949, he transferred the property to his daughters, Wendy B. Fain and Martha Ann (Fain) Roberts, the wife of Maurice Arthur Roberts, Jr.
On October 1/2, 1979, 250 Commonwealth was purchased from Wendy Fain and Martha (Fain) Roberts by Gaetano F. Morello, trustee of the Comm. Ave. Trust. On October 23, 1979, he converted the property into 23 condominium units, The Condominium at 250 Commonwealth Avenue. 248-250 Commonwealth were built in 1878-1879 by John W. Shapleigh, builder, for speculative sale. He is shown as the owner on the original building permit application for both houses, dated June 7, 1878. The architect is not identified on the permit application, but the houses are attributed to Samuel D. Kelley by Bainbridge Bunting in his Houses of Boston’s Back Bay. Samuel Kelley designed 252 Commonwealth at about the same time for John Shapleigh’s brother, Samuel Shapleigh, also a building contractor. 248-250 Commonwealth were built on a 48 foot wide parcel of land, the eastern 43.5 feet owned by George B. Hyde, and the western 4.5 feet owned by Asa P. Potter. On June 3, 1878, John Shapleigh entered into agreements with George Hyde and Asa Potter under which they agreed to sell him the land at a specified price on a future date, and he agreed to build two brick dwelling houses at least 58 feet deep and at least three stories high, not including the mansard roof. On October 11, 1878, as the houses were nearing completion, they transferred the land to him. The land had changed hands several times in the past and was part of a parcel previously owned by Nathan Matthews, part of an even larger tract he had purchased on January 2, 1871, from David Sears, Jr., Frederick R. Sears, and Knyvet Sears. Click here for indices to the deeds for 248 Commonwealth (Demolished) and 250 Commonwealth (Demolished). In early 1879, John Shapleigh was declared insolvent. His assets, including 248 Commonwealth and 250 Commonwealth, were assigned to Joseph F. Paul and George Lewis, appointed by the Court of Insolvency. They subsequently sold the houses to individual buyers. On September 10, 1879, 248 Commonwealth was purchased by locomotive manufacturer William Gordon Means, He and his wife, Martha (Allen) Means, made it their home. They previously had lived at 16 Hancock. Martha Means died in April of 1892. William Means continued to live at 248 Commonwealth until his death in January of 1894. In his will, he left the residue of his estate in trust for the benefit of their children, to remain in trust until January 1, 1900, when the principal was to be distributed. William and Martha Means’s unmarried daughters, Anne Middleton Means and Mary McGregor Means, continued to live at 248 Commonwealth, and on January 18, 1900, the trust established under their father’s will transferred the property to them as part of their shares of his estate. Mary Means died in July of 1904. In her will, she left her interest in 248 Commonwealth to Anne Means, who continued to live there. From about 1913 to 1916, Anne Means was traveling and living at 35 Commonwealth with Arthur Little and his wife, Jessie (Whitman) Means Little. Jessie Little was the widow of Anne Means’s brother, Robert Lawrence Means. By the 1912-1913 winter season, 248 Commonwealth was the home of Anne Means’s brother and sister-in-law, James H. Means and Agnes (Bankson) Means. They previously had lived in an apartment at 261 Beacon. They continued to live at 248 Commonwealth during the 1915-1916 season, after which they moved to Beverly Farms. By the 1916-1917 winter season, Anne Means was living at 248 Commonwealth once again, joined by 1923 by Miss Florence M. Locke. They continued to live at 248 Commonwealth until Anne Means’s death in December of 1923. On December 5, 1924, 248 Commonwealth was purchased from Anne Means’s estate by real estate dealer James M. Burr. The house was razed soon thereafter. On March 10, 1879, 250 Commonwealth was purchased by Charles U. Cotting, trustee on behalf of Thomas O. Rogers, and became the home of Thomas Rogers and his wife, Ruth Wetheral (Mudge) Rogers. Ruth Rogers’s brother-in-law and sister, George Herbert Sprague and Mary E. (Mudge) Sprague lived with them. The Rogerses previously had lived at the Hotel Vendôme, and the Spragues previously had lived at 79 Waltham. Both couples had married in 1877, the Spragues in February and the Rogerses in June. Thomas Rogers was a commission merchant and, in the mid-1880s, was associated with the Essence Manufacturing Company. George Sprague was a boot and shoe dealer. During the 1885-1886 winter season, the Rogerses and the Spragues were living elsewhere and 250 Commonwealth was the home of brick manufacturer John Henry Hubbell and his wife, Sarah Marietta (Dana) Hubbell. They previously had lived in Lincoln. By the 1886-1887 season, they had moved to 283 Commonwealth. The Rogerses and Spragues resumed living at 250 Commonwealth. During the 1893-1894 winter season, they were again living elsewhere and 250 Commonwealth was the home of Samuel Hoar and his wife, Helen Putnam (Wadleigh) Hoar. He was an attorney and general counsel of the Boston & Albany Railroad. In 1893, they had lived at 265 Beacon. Their primary residence was in Concord and by 1895 they were living there once again. By the 1894-1895 winter season, the Rogers and Spragues had resumed living at 250 Commonwealth. The Rogerses continued to live there until about 1909, when they moved to the Hotel Lenox at 61 Exeter and then to 1080 Beacon in Brookline. The Spragues also moved to the Hotel Lenox, after which they separated; he moved to Chicago and she moved to Brookline with the Rogerses. In 1909, 250 Commonwealth was the home of Thomas Rogers’s brother-in-law and sister, Francis Manning Stanwood and Louisa Blair (Rogers) Stanwood. They previously had lived at 527 Beacon. They also maintained a home in Manchester. He was president of the Hotel and Railroad News Company, and formerly had been manager and editor of the Boston Journal. By the 1909-1910 winter season, they had moved to 393 Marlborough. 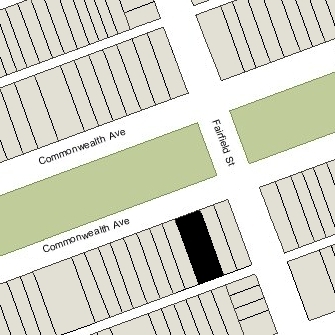 On November 1, 1909, 250 Commonwealth was acquired by real estate dealer James Sumner Draper. On June 27, 1910, 250 Commonwealth was acquired from J. Sumner Draper by Francis Bacon Sears. He and his wife, Mary Elizabeth (Sparhawk) Sears, made it their home. They previously had lived at 284 Marlborough. He was a banker and also served as treasurer of several cotton mills in Georgia and South Carolina. The Searses’ son-in-law and daughter, attorney Henry Endicott, Jr. and Katharine (Sears) Endicott, lived with them (they also had lived with them at 284 Marlborough) and also maintained a home in Weston. In October of 1910, Francis Sears filed for (and subsequently received) permission to build a storage building at the rear of the property. During the 1913-1914 winter season, Henry and Katharine Endicott moved to 131 Marlborough to live with his mother, Mary Hubbard (Howe) Endicott, the widow of Henry Endicott. Mary Endicott moved soon thereafter and 131 Marlborough became Henry and Katharine Endicott’s home. Francis Sears died in August of 1914. Henry and Katharine Endicott moved back to live with Mary Elizabeth Sears at 250 Commonwealth during the 1914-1915 and 1915-1916 winter seasons. They then made 131 Marlborough their home. In about 1916, Mary Elizabeth Sears built a home in Weston on the site of her former home, which had been destroyed by fire in 1906. She continued to live at 250 Commonwealth and in Weston until her death in 1923. By 1924, 250 Commonwealth was the home of Matthew Luce and his wife, Mary Cobb (Hovey) Luce. He was a wool merchant. They had lived at 267 Beacon in 1923. By 1925, they had moved to 367 Beacon. During the 1924-1925 winter season, 250 Commonwealth was the home of Kenneth Seyton Billings and his wife, Marjory Church (Fish) Billings. They previously had lived at 378 Marlborough. He was associated with the iron and steel manufacturing business founded by his father, George Herric Billings. They subsequently moved to Weston. On December 24, 1924, 250 Commonwealth was purchased from Mary Sears’s estate by real estate dealer James M. Burr. The house was razed soon thereafter.